South Africa is a country of many diverse cultures; thus ‘rainbow nation’. The original inhabitants of South Africa were the San bushmen and the Khoikhoi. The name Khoisan is an integration of the two names of the first inhabitants of modern day South Africa. The rainbow nation was formed when migrants from Sub-Saharan Africa migrated to South Africa and the Dutch decided to send people to the country to set up a refreshment station for ships travelling from Europe to East-Asia. The Dutch people brought slaves from Malaysia and Java with and they are an integral part of South Africa’s history. Emigrants from France and England also inhabited the country as well as Indians and Chinese. There’s more sordid history behind the current nation we call home, but let’s not get into all that here. All these immigrants brought with them a unique cookery style introducing the country to a variety of ingredients and spices. 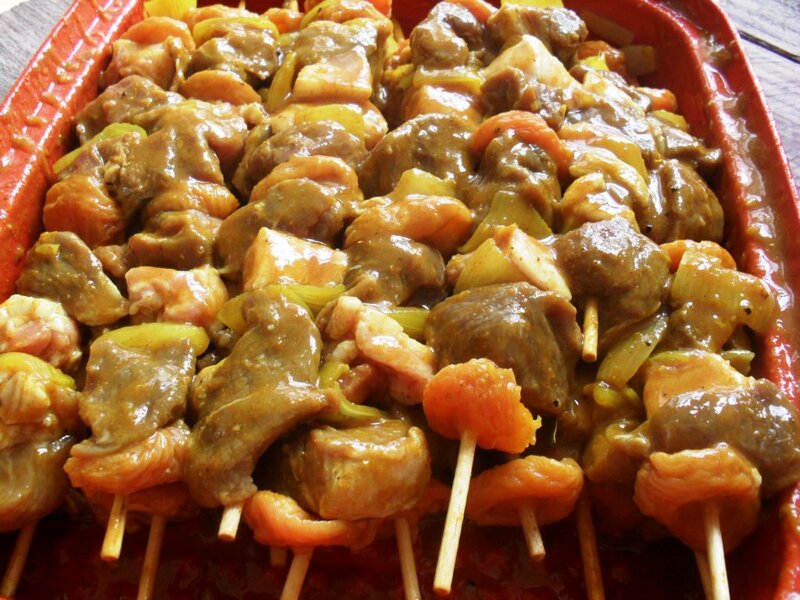 Sosaties are a traditional South African dish, brought over from South East Asia and are made of skewered meat, marinated in a curry mixture; it is also commonly known as kebabs in other parts of the world. 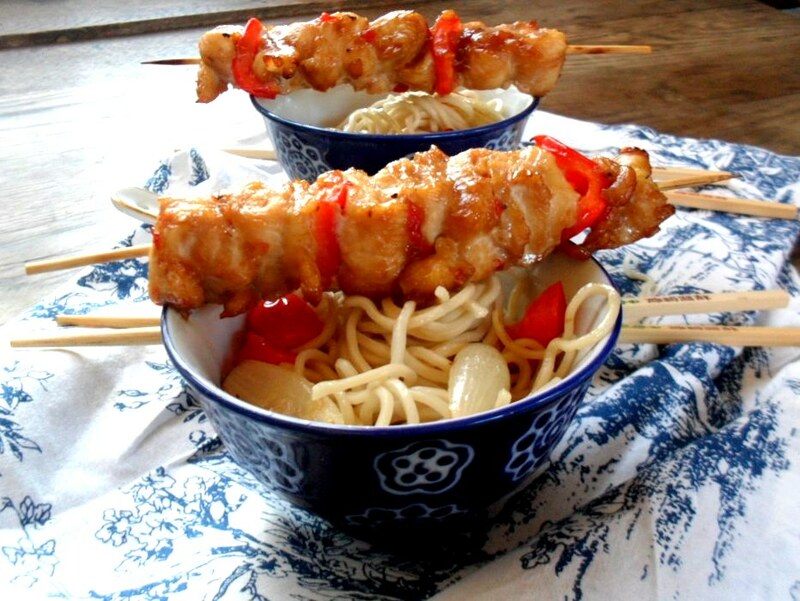 These chilli chicken sosaties are not marinated in a traditional curry sauce but is marinated in a sweet chilli sauce marinade and served with egg noodles. I grilled these sweet chilli sosaties in the oven but you can cook them on a fire if you prefer. 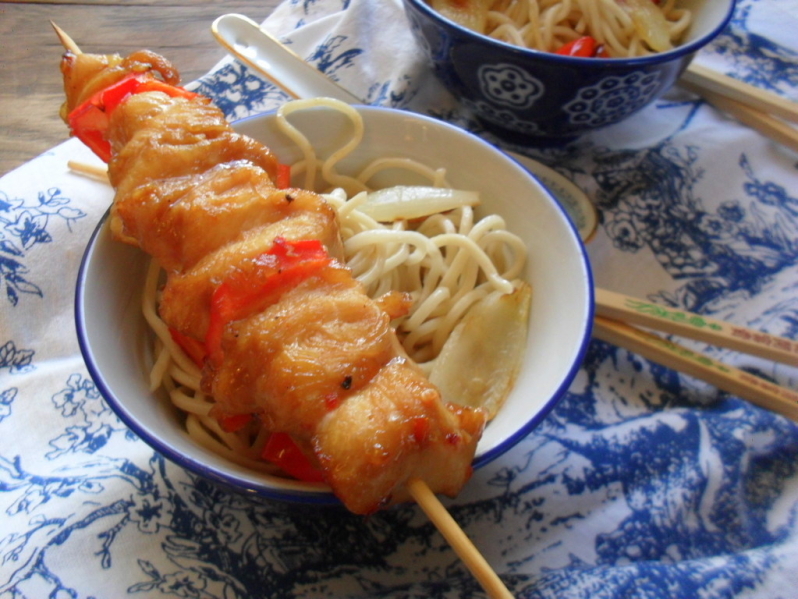 Serving the sweet chilli chicken sosaties with noodles gives it more of a Chinese flair, but you can serve it with any other side dish. I hope you will have fun making these! Thread the chicken strips with some cubed red peppers onto skewers and place into a marinade bowl. 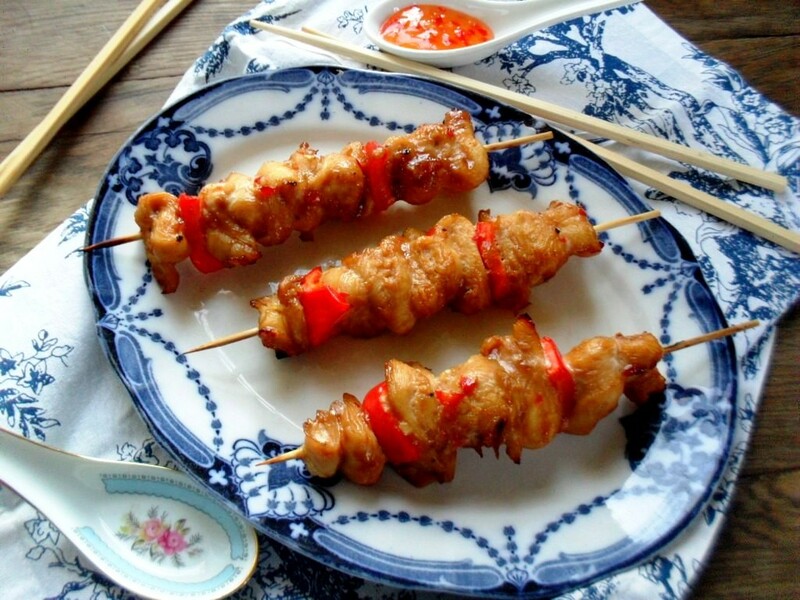 Mix the sweet chilli sauce and soya sauce together and drizzle over the chicken skewers. 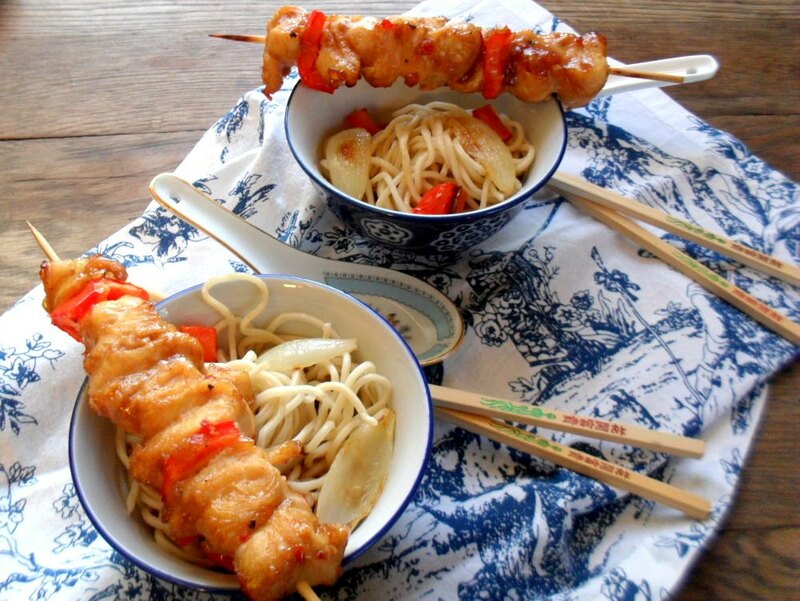 Shake the bowl to cover the skewers on all sides with the marinade. 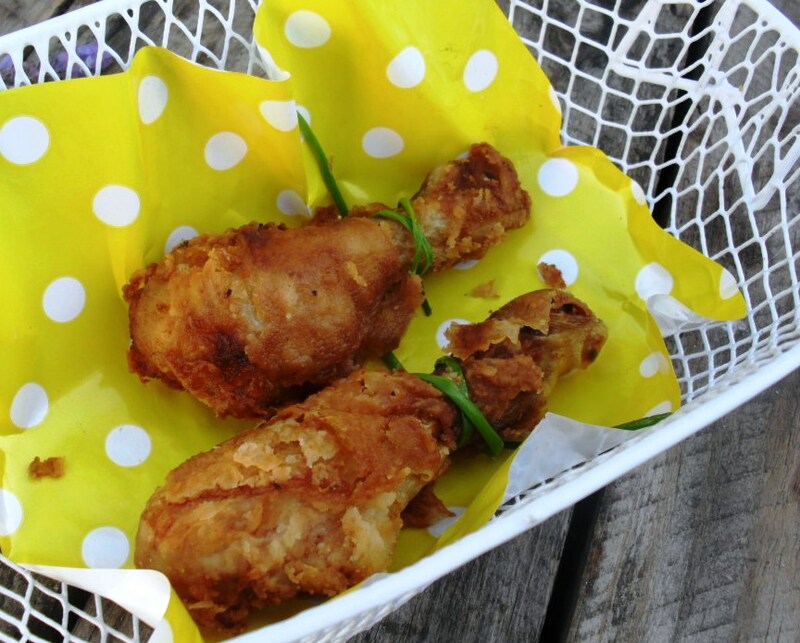 Place the chicken skewers onto a greased baking tray and cook for 10 minutes. Turn the skewers over and cook for another 10 to 15 minutes until cooked through. Cook the noodles in salted water according to packet instructions. 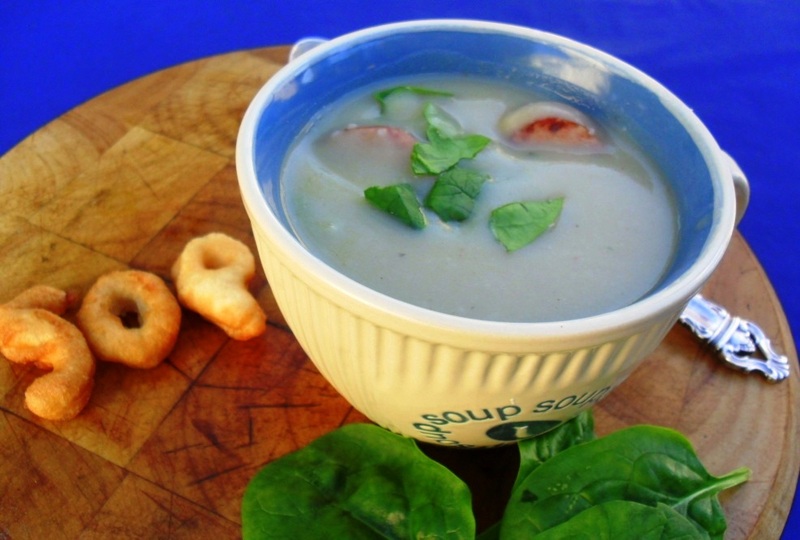 Drain and place into a serving bowl. Whilst the noodles are cooking, heat the olive oil in a frying pan and fry the onions and peppers on low heat until soft and fragrant. Add the onion-pepper mixture to the noodles and stir through. 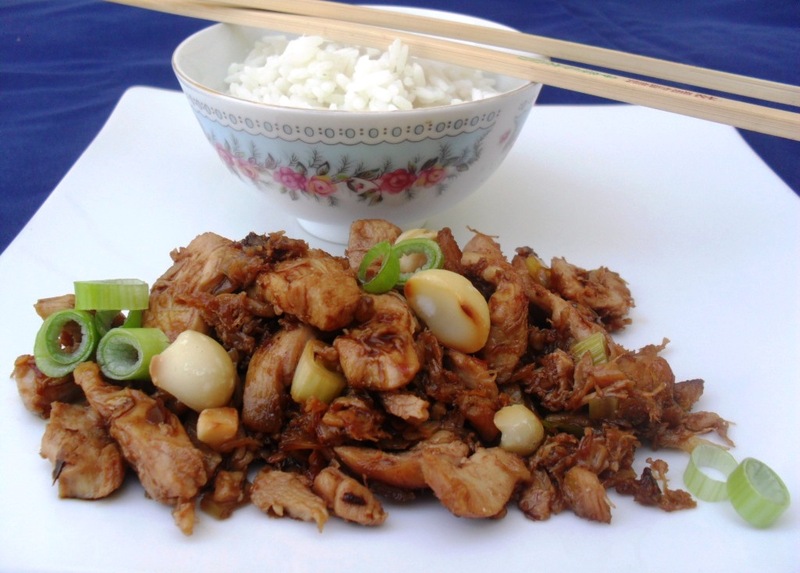 Serve with the sweet chilli chicken sosaties. Another good one to bookmark! I hope make it, Col! It will be delicious done on the braai.